A French baguette is one of the most classic breads and is also one of the simplest to make – you will be surprised at how easy it is to turn out a few loaves. And, there is nothing better than the smell of warm bread wafting throughout the house. If you are having a dinner party, plan to have the bread come out of the oven as the guests are arriving. Slice the warm bread and serve with cheese or a basil pesto. The crowd will go wild. If there is any left over, have it for breakfast – Pain Perdu or French Toast. Some use bread machines or mixers to make bread, but there is really no reason. You can simply mix the ingredients in a bowl and then knead with your hands for five minutes until the dough goes from a sticky mess into a silky elastic tactile delight. Bread basics: The magical transformation of sticky water and flour into smooth and supple dough is the result of a chemical reaction whereby one of the proteins in flour – gluten – reacts with the water and forms long interlocking molecular chains as you knead. 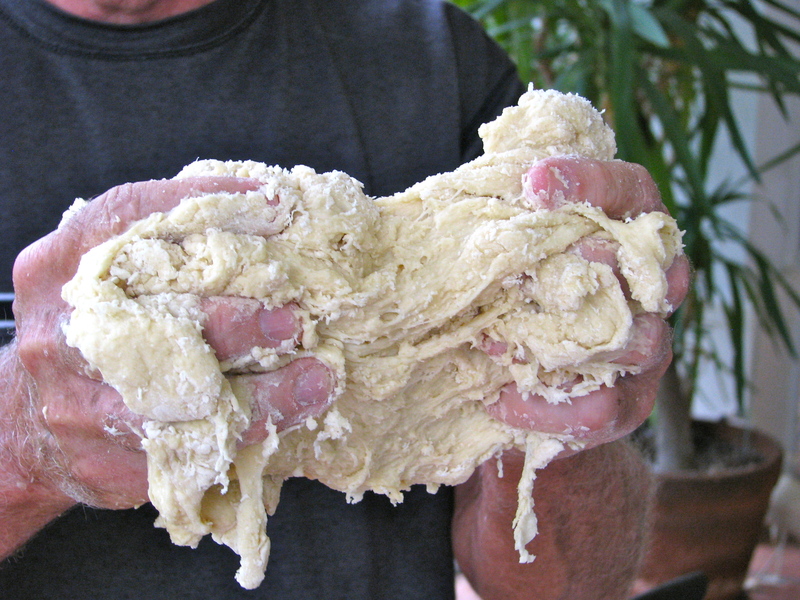 Without the gentle kneading, the chemical reaction will not take place. The yeast that is added to the dough is actually a single cell fungi that consumes the maltose sugar in the flour and excretes gaseous carbon dioxide. The gas bubbles are held inside the bread by the strong mesh of gluten molecules; thus the bread dough “rises”. There is plenty of food for the yeast and you can squeeze the risen dough, exhaust the carbon dioxide, form the dough into loaves and let the yeast start all over again. The heat from the oven finally kills the yeast, but the gas bubbles leave their mark in the dough and give us that porous baked product we call bread. Yeast is everywhere. Put out some water and sugar in a bowl for a week and you will attract yeast from the air. Remember Robinson Crusoe when he finally succeeded in baking bread? He certainly didn’t go to the store for his yeast. The recipe below makes two medium size loaves. I like to make two batches, bake all four in the oven at the same time and freeze one or two for later. Make sure you make two batches and not double the recipe. If you do the latter, you will have an unmanageably large dough ball. Restoring Frozen Bread: It’s easy if you know this simple trick. Preheat your oven to 350 degrees and put the frozen loaf straight from the freezer directly onto the oven rack and warm for 15 minutes. You will think it just came out of the oven for the first time. Let the water from the tap get reasonably hot and put 1-1/4 cup into a measuring cup. Grease the bottom and sides of a large mixing bowl. Grease a baking pan also. Mix the yeast with the hot water and let sit. Make sure the yeast is well dissolved. Combine the flour, sugar and salt in a mixing bowl. Add the water and yeast mixture to the dry ingredients a little at a time, mixing with a wooden spoon. Don’t bother too long with the spoon (under 30 seconds). As soon as the water is reasonably incorporated, get your hands in there and start kneading. 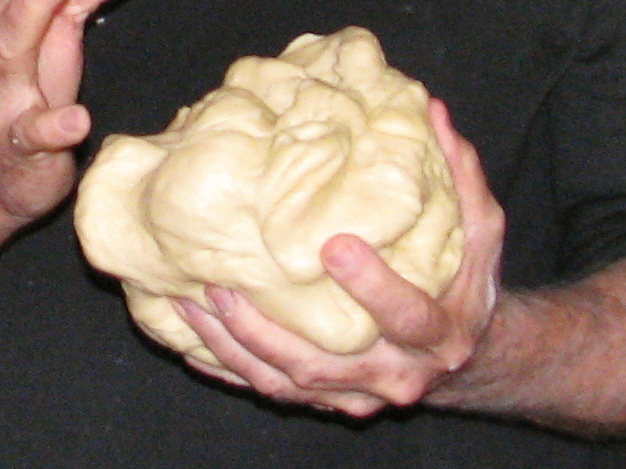 A sticky dough ball will quickly form. You can continue to knead with the dough in the bowl, but it is much more enjoyable to take it out and walk around the room kneading and telling everyone about the primal nature of making your own bread. It is important to have an audience for this philosophical rant. Once the dough has gone from sticky to smooth and elastic (about 5 minutes), form into a ball and put into the greased mixing bowl. Cover with plastic wrap, sit in a warm spot and let the dough rise for one hour. When the dough has risen (it will be about double in size), take it out of the bowl, gently knead it a couple of times and divide it into two equal parts. 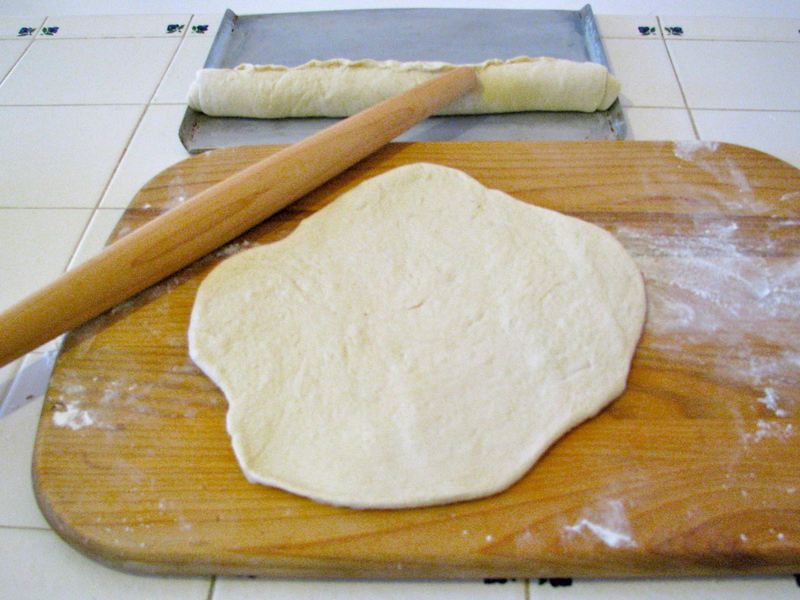 Roll each piece out to about a 12 inch rounded square. Basically, you are trying to make a square, but it always ends up rounded on the corners. 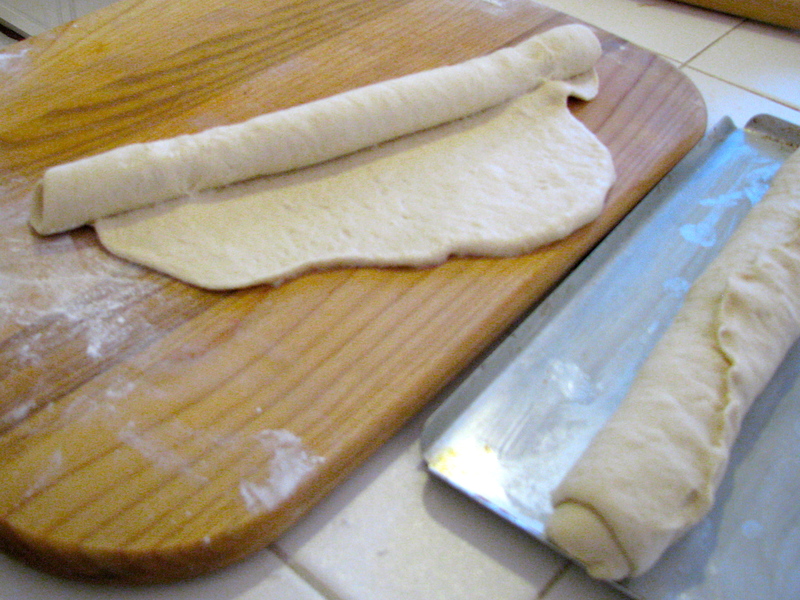 Starting on one side, roll up the dough and pinch the end onto the main body of the loaf. 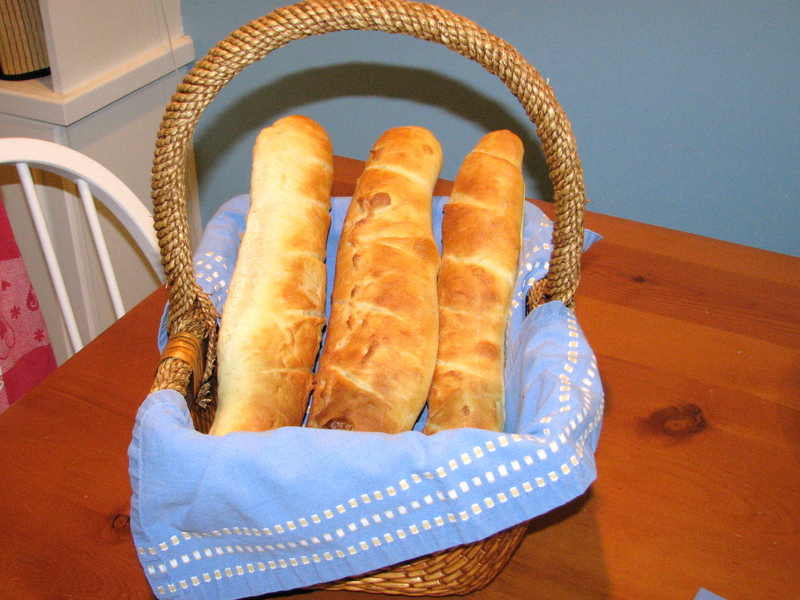 Place the loaves on the greased baking pan, cover lightly with a kitchen towel and let rise for one hour. After the loaves have risen, use a bread knife to make 4-5 diagonal slits across the top. Using a pastry brush, liberally apply the water/salt glaze and bake loaves for 20-25 minutes until golden brown. You can also add poppy seeds or sesame seeds at this point if you wish. Thanks for the photos of the kneading. Glad to see that after the mess, all will come together! It will taste great!